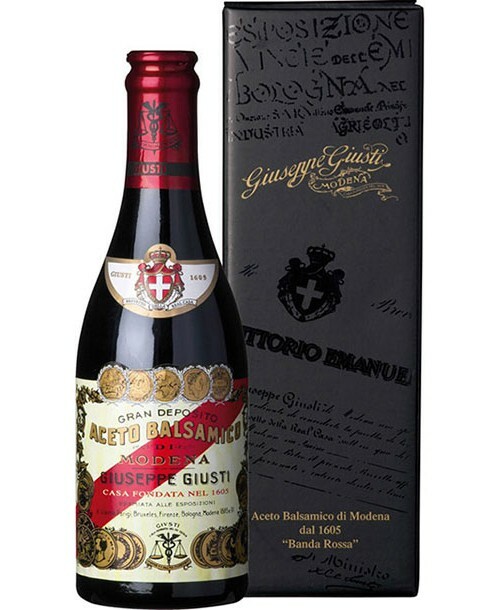 Giusti - that is ancient nobility among the Balsamico producers since 1605, that are great traditional products, that is high quality, that is history, that are century-old barrels for the maturation of Balsamic vinegar... one could continue forever. Primarily, the company Giuseppe Guisti is considered King of Balsamico producers as well as co-founder of the "Golden Rules" for the production of first-class Balsamic vinegar, which Giuseppe Giusti wrote down in 1863 on the occasion of the Tradeshow in Modena (Esposizione Agraria). Today, this scripture is known as "La Recetta die Giusti" (Giusti's recipe). To keep the image of a pioneer, Giusti created a high-quality collection of Balsamic vinegars over the years, that convinces with a unique, delicate character. The pride on their own history, the love for their own tradition, the patriotism for their own past and the passion for their own product still show today in high-quality, authentic and individual Balsamic vinegars.